Every time you turn around, one of your friends is asking you to spend money on the newest Direct Sales business that they’ve joined. But I’m going to teach you how to support my Paisley Raye business without spending a dime. I love Direct Sales and the opportunity that it provides men and women. Opportunities to work from home, provide for their families, and grow both personally and professionally. But my wallet doesn’t quite love Direct Sales as much as my heart. So many of my friends are selling something and I simply cannot buy from all of them. And as a direct seller, I know you can’t buy from all of us either. 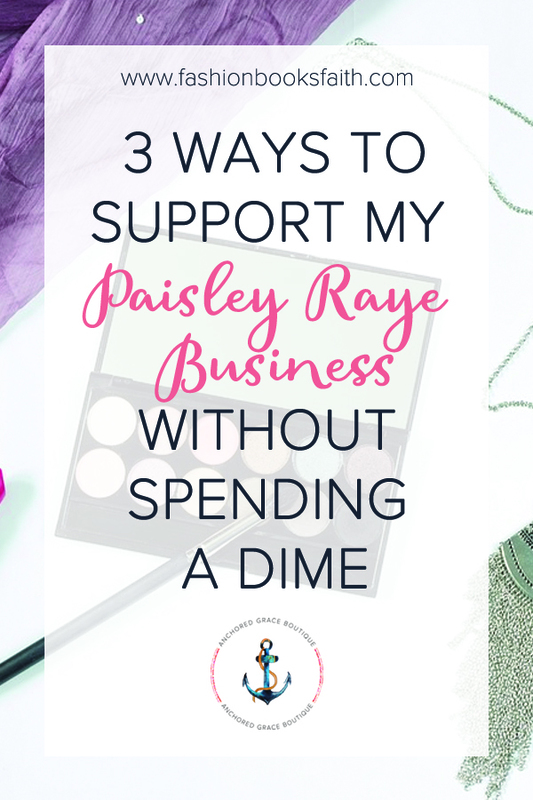 Here are 3 ways you can support your direct selling friends and my Paisley Raye business without spending a dime. 1. Spread the Word – this is a huge help. You can spread the word in person, or on social media. Tell your friends about your favorite direct seller. You might not need the product right now but maybe your friend is looking for the perfect new dress or top right now. For my Paisley Raye business, I offer a referral reward. If you head over to my website – anchoredgraceboutique.com – you can register for my rewards program. There you’ll find your own personal referral link. Share that link with your friends – for every friend that makes a purchase from that link you will get a reward! 2. Support them – besides shopping, this is the biggest help for my business. When I post on social media – comment, like, share, engage. This helps others to see my social media content and helps my business to grow. The world of social media is challenging and the best way to overcome that challenge is to have friends who interact when you post. I have a Paisley Raye community group – in that group, I share information about Paisley Raye including new product launches and new inventory. But my community group is about so much more than business. In the group we support each other, we pray for each other, we encourage each other, and we have fun together. I’d love to have you join our group and become a part of our community. 3. Do a review – if you own the product, do a truthful review about it. When someone asks about the product, share where you got it. Tell your friends on social media about the new dress you love and who you got it from. The words of a customer are the best way t0 help grow your friend’s direct sales business. We appreciate you. Every direct seller truly appreciates the help that they get from their friends in growing their business. Want to help grow me grow my Paisley Raye business? Drop me a message or head over to our group and discuss there.